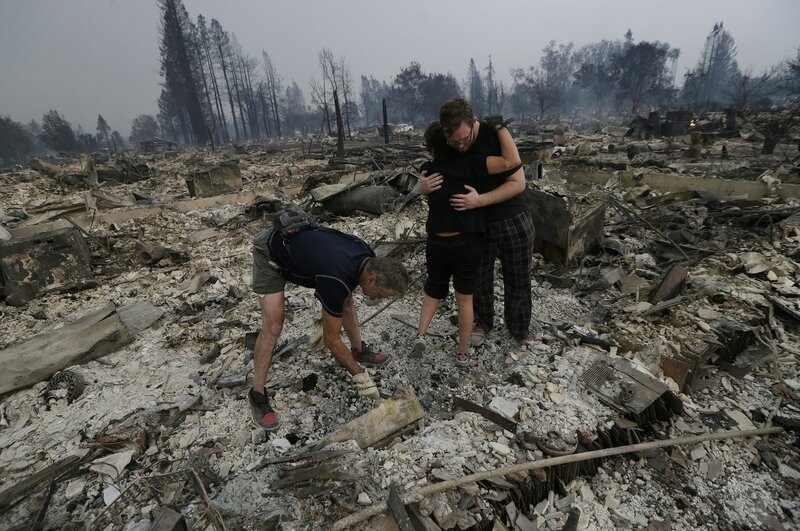 LOS ANGELES — Powerful wildfires fanned by strong winds ravaged parts of Northern California’s wine country on Monday, killing at least 11 people and destroying some 1,500 structures. With increased resources headed to the region to battle the wildfires, “hopefully we’ll start seeing some turnaround throughout the course of today and into tomorrow,” Cal Fire Deputy Chief Scott McLean said Tuesday on TODAY. Gov. Jerry Brown declared an emergency in the affected counties, which include Napa and Sonoma, and asked for a federal declaration of a major disaster for the entire state. In Sonoma County, officials said they had received more than 100 phone calls to its missing persons hotline, although they believed some could be duplicates. Marian Williams of Kenwood, in Sonoma County, told NBC Bay Area that she joined a caravan of neighbors driving through the flames before dawn as one of the fires reached the area’s vineyards. The 15 wildfires — which also engulfed a hotel and a trailer park in the city of Santa Rosa and sent smoke spewing as far south as San Francisco — have collectively become among the most deadliest in California’s history. The California Department of Forestry and Fire Protection confirmed that one person was killed in Mendocino County as well as two people in Napa County. They were identified by NBC Bay Area as 100-year-old Charlie Rippey, a World War II veteran, and his 98-year-old wife, Sara. Their son, Chuck Rippey, told the station that their caregiver contacted him as the fire closed in and said his parents were still inside the Silverado Golf Course home they lived in for the past 40 years. Mark Ghilarducci, director of the state Office of Emergency Services, agreed Monday that other deaths were likely across the region. Since the fires were moving so rapidly, he added, authorities were “still trying to get our hands around” the full extent of the damage and casualties. The National Weather Service warned that very low relative humidity, coupled with strong and gusty winds, would continue to pose a critical threat through Tuesday morning. Winds were expected to weaken later in the day and on Wednesday, with higher humidity spreading slowly inland. All of the new fires started after 10 p.m. PT (1 a.m. ET) on Sunday, Pimlott said, bringing the total spread of more than 25 fires across the northern half of California to about 73,000 acres at what he called the worst possible time. The hot, dry blasts are sometimes called los diablos, or “the devil winds,” and they often create critical fire conditions. “Sometimes we get away with these wind events, and other times we get caught,” he said. Capt. Craig Schwartz, acting chief of the Santa Rosa police, said evacuation efforts were continuing. “Officers were going in and reporting that they were having a hard time getting out,” he said. Brown said Monday night they anticipate more destruction, which would hit both homes and public infrastructure. The governor added that officials would continue to do preliminary damage assessments as soon as conditions permit access. 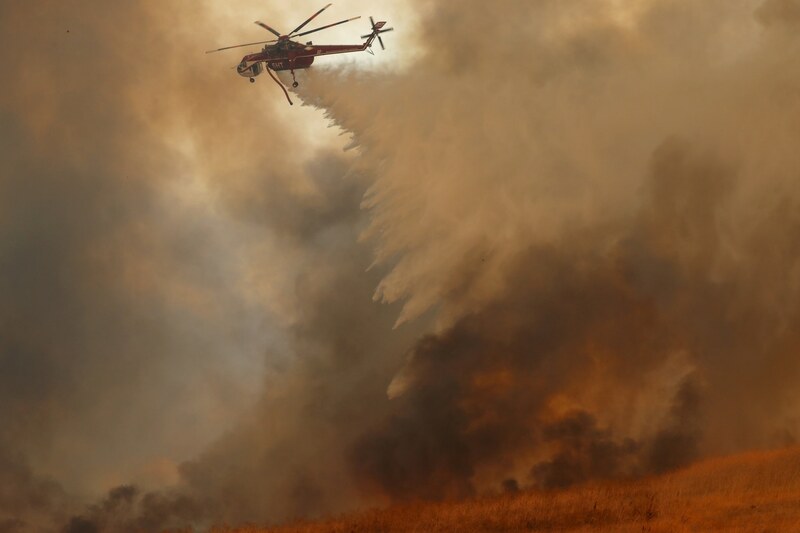 The Federal Emergency Management Agency immediately agreed to the state’s request for federal funds to help fight many of the fires, the Department of Homeland Security said. But Northern California wasn’t the only part of the state inundated by infernos. The Canyon Fire 2 wildfire was scorching rugged terrain in Anaheim Hills in Orange County, about 40 miles southeast of Los Angeles. More than 6,000 acres were burned by late Monday and at least 24 structures were destroyed with another 5,000 threatened, fire officials said. Evacuation shelters were set up Monday and Tuesday in nearby communities, including the city of Anaheim, where Disneyland is located. The wildfire — the biggest in the county in nearly a decade — cast an eerie orange glow in the sky above the theme park, which remained open.